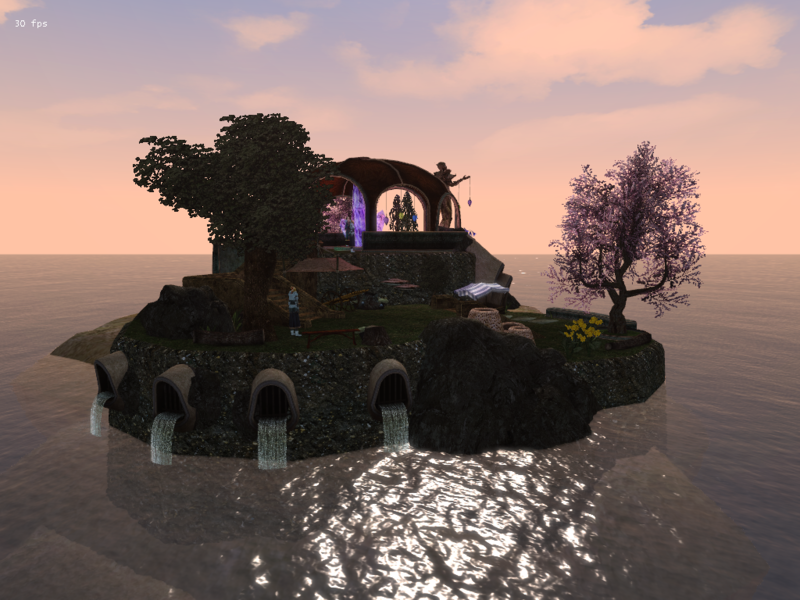 A tranquil island in the middle of gods knows where? I like it. Thank you! The NPC's here refer it as sort of a "paradise", so i'm glad it seems tranquil to you, because that's what I was going for. A place away from the hard Vvardenfell life. Also, this screenshot was taken days ago, but I have added a bar to go to also, to get a drink, and there's even a table by the shore to watch the waves roll in, and chill. I'm fine with you using that model. I'd also be willing to throw together a unique Dremora for your claim as an alternative if you want. Let me know. Oh also Melchior, it has been awhile and i'm going to scrap that idea I posted a while ago, you don't need to make a new model. Wow, really love all the progress you've made on your plot! Looks like you've got a lot of awesome looking interiors already, can't wait to see how it all comes along! Thank you, very glad you like it! Just watched the progress video you made. Everything is looking really great!! My latest addition to my homestead in ModTown, plot 45 is a new realm. You enter this realm via a portal in Bagel's Homestead, and the portal will take you to the bath/pool area. 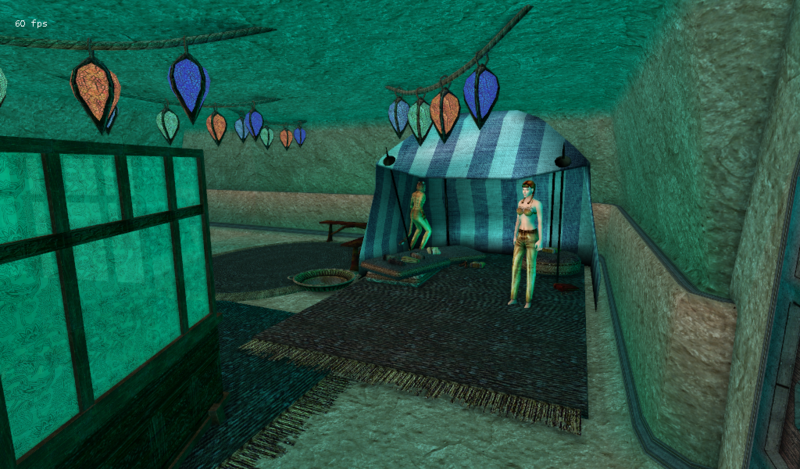 This area will have (obviously) a pool, and a changing room and some NPC's. There will be a door that leads you to the exterior (It's actually an interior, it just acts as an ex.) 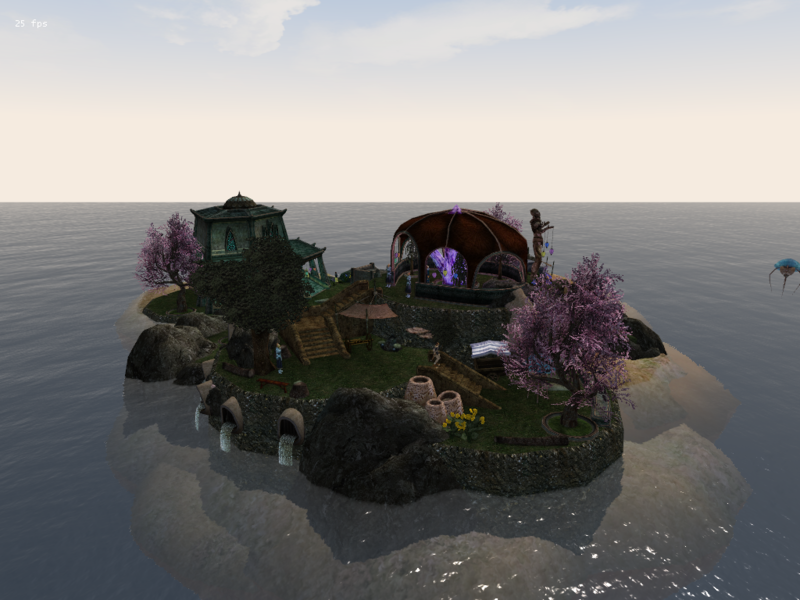 This exterior is an island that contains; NPC's, including the "Valkyrie's of Bagel (guards), and others. 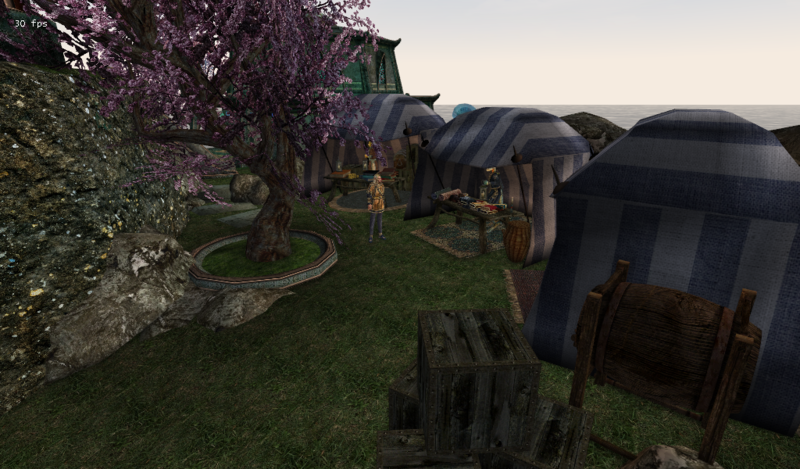 It also contains; a main power crystal, a bar (The Dazed Guar Tavern), beach areas, a small shrine, and a market area with three small shops/stands. There will also be a quest involving two argonians and ones hatch-day. You will have to go on an egg-hunt across the island. here's a part of the bath/pool area. this is the power crystal. It glows really nicely at night. The story is that Bagel wanted more; so Aloros and him created a new realm. It's powered by that crystal, and the Valkyries of Bagel protect it, leaded by Brisk (The main high Elf in the photo). This is the market area. It looks great at night (well, the whole realm does). Here's the Dazed Guar Tavern (the mournhold styled building in the 1st photo). 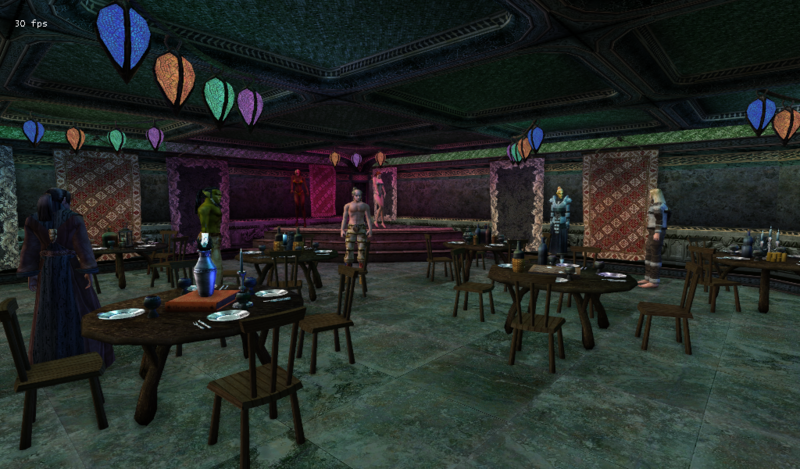 This Tavern is hosted by Kyte, a High Elf. There's also a talking Guar; Disko, in the 2nd floor. 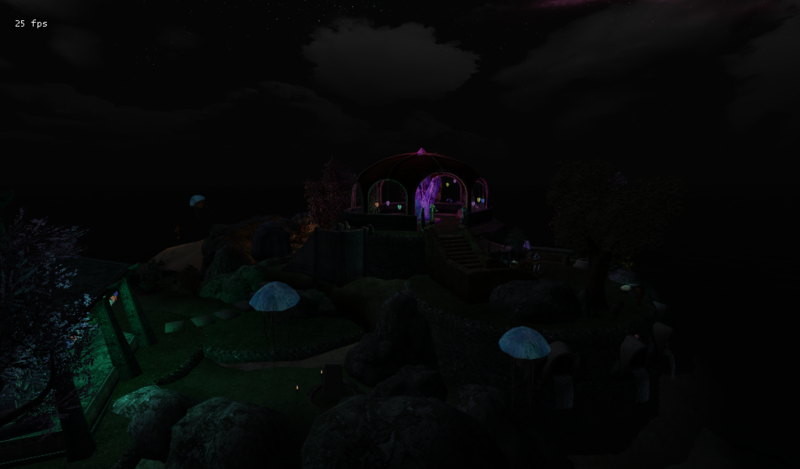 It's a dark image, but the island glows at night, especially the Power Crystal. Looks prett cool. Oh, and there will be netch loating about. It makes it look so.. majestic. Looking really good. 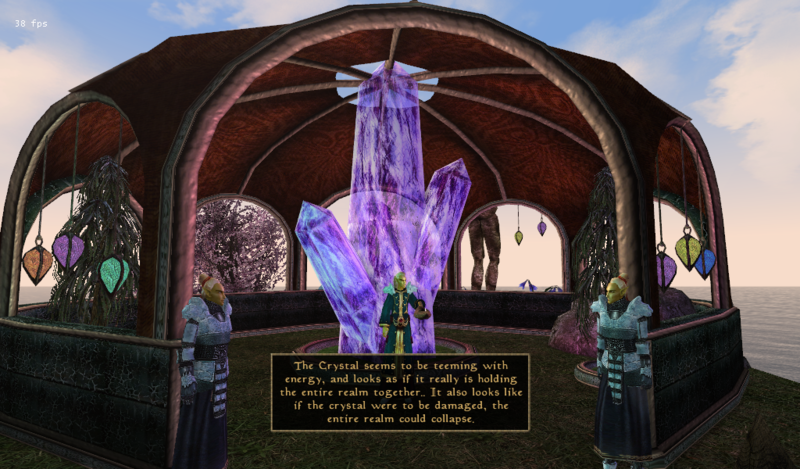 Out of curiosity, would it be at all possible to damage the crystal? That would be a really fun and cool feature, but scripting-wise, I wouldn't know how to pull that off. I could see it as you hit it, and maybe once you hit it enough it would teleport you back in Mundus, and the portal to the realm would be gone, and all the NPC's would hate/ttry to kill the PC. I like the idea though, I just don't know how to script that. I thought that might be the case, sadly I know really next to nothing about scripting so I won't be of much help. I can do it. I would need to make a creature version of the crystal, to simplify the process, but I can do it. Wow Autoclock, thanks for the offer, that would be fantastic. Should I attach the file so you can work from there?